The Federal Communications Commission voted on Thursday to repeal the Obama-era net neutrality rules that imposed greater regulation over the internet. On a party line vote, the FCC approved Chairman Ajit Pai's Restoring Internet Freedom proposal, which repeals the 2015 Title II rules. Net neutrality, for the first time in history, classified internet service providers as utilities, rather than information services. "Following detailed legal and economic analysis, as well as extensive examination of comments from consumers and stakeholders, the Commission reversed the FCC's 2015 heavy-handed utility-style regulation of broadband internet access service, which imposed substantial costs on the entire internet ecosystem," the FCC said. "In place of that heavy-handed framework, the FCC is returning to the traditional light-touch framework that was in place until 2015." The vote was briefly halted when the FCC meeting room had to be evacuated due to a security threat. Net neutrality supporters have engaged in a heated campaign against Pai since he announced intentions to roll back the rules earlier this year. A man was arrested for making a death threat against Republican congressman John Katko over the net neutrality issue. Pai and his family received numerous threats, and alt-left groups involved in the violent riots during the inauguration targeted Pai's neighborhood. The FCC said ISPs will again be classified as an "information service" under Title I of the Communications Act, which was affirmed by the Supreme Court in 2005. Mobile broadband internet services will also be reinstated as private mobile services by the FCC. 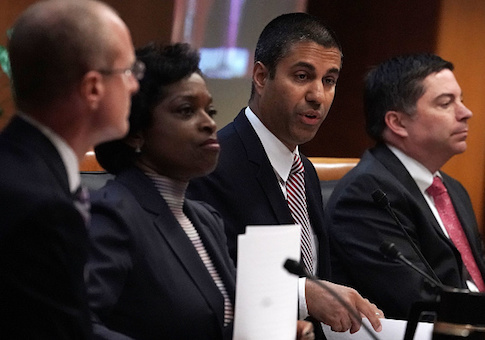 Net neutrality led to regulatory uncertainty, less investment in broadband, and hampered innovation among smaller ISPs in rural areas, the FCC said. Capital expenditure in broadband declined by 5.6 percent since Title II was adopted two years ago, which amounted to over $3.6 billion in lost investment. Pai's Restoring Internet Freedom will still require ISPs to disclose to their consumers if they block or throttle traffic over their networks. "The FCC's action today has restored the jurisdiction of the Federal Trade Commission to act when broadband providers engage in anticompetitive, unfair, or deceptive acts or practices," the FCC said. Republican FCC commissioners Michael O'Rielly and Brendan Carr joined Pai in voting for repeal. Democratic commissioners Mignon Clyburn and Jessica Rosenworcel dissented. The vote came three weeks after Pai released his proposal to the public, a contrast from the previous administration. The vote to put net neutrality in place was shrouded in secrecy, as former chairman Tom Wheeler did not release the text of the nearly 400-page rule until two weeks after the FCC voted to approve it. Republicans offered widespread praise for the FCC vote, including House Republican Conference Chair Cathy McMorris Rodgers. "I support an open internet, but there is a better way to ensure consumer protections without disrupting the free flow of information and innovation that has made it a cornerstone of the 21st Century economy," Rogers said. "The heavy-handed rules from the Obama administration stifled investment in rural communities, like those in Eastern Washington, and created uncertainty for ISPs in meeting the requirements of those rules." "What I want is for everyone to come to the table to find a bipartisan, legislative solution that will protect consumers while not harming investment, innovation, and free-market principles," she said. This entry was posted in Issues and tagged Net Neutrality. Bookmark the permalink.